Ponteland school children Thomas and Molly Storer enjoyed the music also in the picture Spencer Mullens, Maureen Curd, Mrs Margaret Hancock and Mr John Hancock. 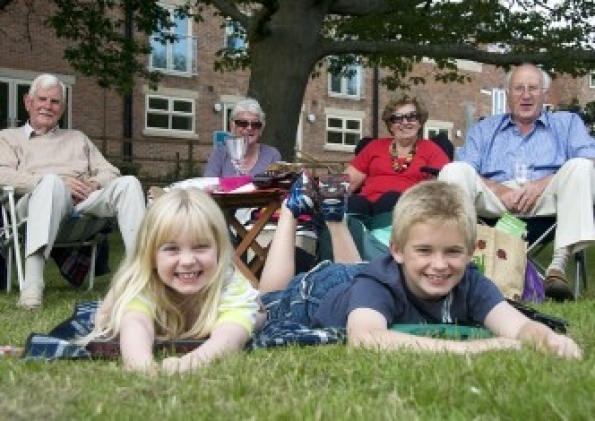 HUNDREDS of families enjoyed an evening of entertainment in Ponteland Park on Saturday. And BBC Look North weather presenter Paul Mooney brought the sunshine as he compered Music in the Park. An estimated 300 people came along to enjoy performances by singer Katy Reilly, Dunston Silver Band, Ponteland Community Band and the St John's Singers from Wideopen. The event, organised by Ponteland Town Council and Ponteland Lions Club, was free but generous donations on the night saw £400 raised for the ex-servicemen's charity Help for Heroes. Coun Peter Cowey, Mayor of Ponteland, said: "Paul Mooney couldn't have forecast better weather for us — it was a lovely balmy evening. "I'd like to thank Paul and all our performers for putting on such a great programme of entertainment. "We were delighted to see so many people of all ages enjoying a fantastic community event and we are very grateful for the generous donations to Help for Heroes. "Special thanks should also go to volunteers who helped in the building of the marquee and stage and then dismantled it after the show."